Four people were taken to hospital after a toxic material leak in downtown Montreal Thursday afternoon. As a result of the leak, an urgent water advisory was in effect from 4:40 p.m. until 11:20 p.m. The City of Montreal said almost everyone in the region bordered by Bleury St., Beaver Hall Hill, René-Lévesque Blvd. and Saint-Antoine St. can use their water safely. There are a few exceptions: Water at 443, 445, 447, 449, 451, 453, and 455 Viger St. West, at 454, 456, 470 de la Gauchetiere St. West, and at 1030 St. Alexandre St. is not safe to use for anything except flushing toilets. The leak happened in a condo building at the corner of Saint-Alexandre St. and Viger Ave., where a check valve failed, drawing concerns a toxic fluid by Magnatrol, which is used to kill bacteria like Legionella, flowed into the city's water supply system. 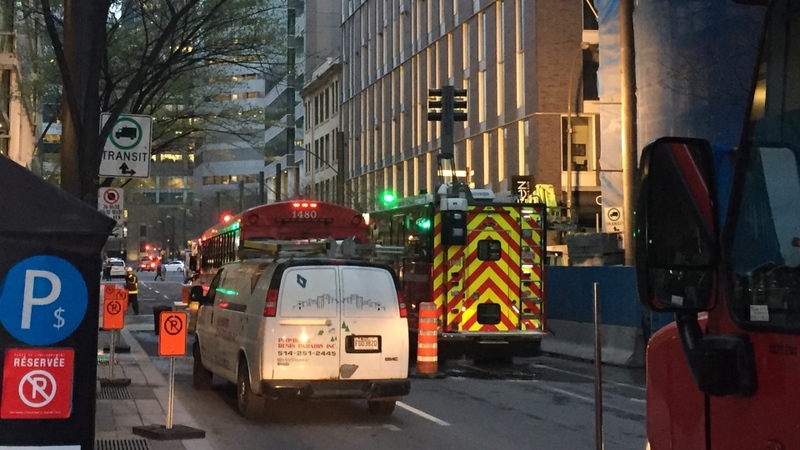 Montreal fire department operations chief Marwan Shedeed said a janitor in the building at 445 Viger notified authorities when he discovered a valve malfunctioning. "He found something on the check valve of the system. I don't know exactly what's the process but there was a problem with the check valve," said Shedeed. He believed some of the liquid leaked into the city’s water system, but officials could not determine how much. In total, seven people became ill, including the four who were taken to Notre-Dame Hospital to be treated. Their symptoms included vomiting and diarrhea, said Shedeed. Magnatrol, a powerful biocide, is used in cooling system to prevent Legionnaire’s Disease as a result of a regulation put in place after an outbreak in Quebec in 2012. Late Thursday night came news the municipal water hadn’t been affected by the leak. Residents in two condos of at least 90 units each were forced out of their homes, as were a few other local residents. People at those 11 addresses were required to use bottled water all day Friday, and remain under that advisory until the building is sure its internal water system is safe. “That points to a weakness in the current regulations in terms of how we manage these large internal systems and it also points to a weakness in the regulations on cooling towers, namely that we didn't know which chemicals… at what concentrations they were used and the delay caused a lot of unnecessary concern because the information was not available right away,” said Provost. HazMat teams, as well as public health officials were at the scene Thursday night and tested the water, while city workers opened fire hydrants to flush the water out of the system. The nearby W Hotel said it had alerted all guests with a loud speaker and also slipped notes under guests’ doors to advise them. Local restaurants were also affected, including Restaurant Green, which was forced to close. “For today it's very bad, because the sun’s outside and normally it's a good day for every store on the street,” said Romain Leblevec, district manager of the restaurant. A water advisory in part of downtown Montreal.